I made it to London! I was absolutely exhausted and sleep deprived, but I made it. Since there are no direct flights to Heathrow from Tampa, I connected through Chicago. And let’s just say the whole notion of staying calm came into play on this flight. I had a one (ish) year old directly behind me, and while I can only imagine how hard it is to travel with young kids, it took a lot out of me to ignore the constant kicking and banging. But I just let it go and sent the mom positive vibes knowing I’ll probably have to go through it at some point and would want people to do the same for me. During my four hour layover in Chicago, I finished my latest book, walked around the terminal to build up an appetite, and ate dinner at Tortas Frontera (SO good!). Then came an almost 10 hour flight to London. I’m super fortunate that when I travel overseas for work I have the opportunity to fly premium economy. With that being said, all the extra space did me absolutely no good this time. My left leg was throbbing the last half of the flight, my neck was killing me the entire time, and I just couldn’t get comfortable. Not all was lost though. The guy sitting next to me was super friendly and interesting. He shared a lot about his life in Mozambique – from his work and family situation to proposing to his girlfriend soon. Love making airplane friends! By the time I got through customs and baggage claim and made it to my hotel, it was a little past noon. I unpacked a bit, showered, and then fell asleep for FOUR HOURS! I certainly didn’t intend to sleep that long but am glad I did because I was SO tired. And then I got ready to meet up with Khushboo! 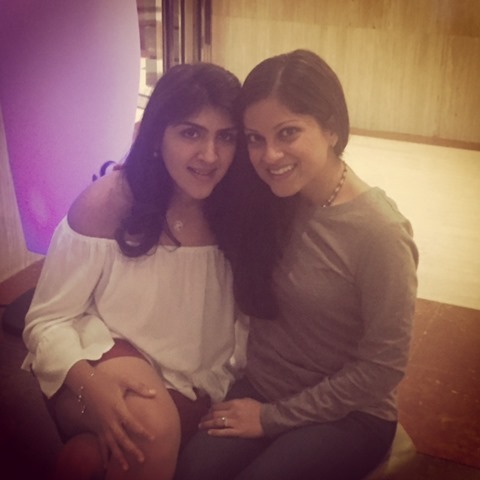 As I mentioned in my last Three Thing Thursday post, Khushboo and I have been reading each other’s blogs for over four years now. And over the course of time, we’ve gone from commenting on our blogs to emailing each other every now and to finally meeting up in person. 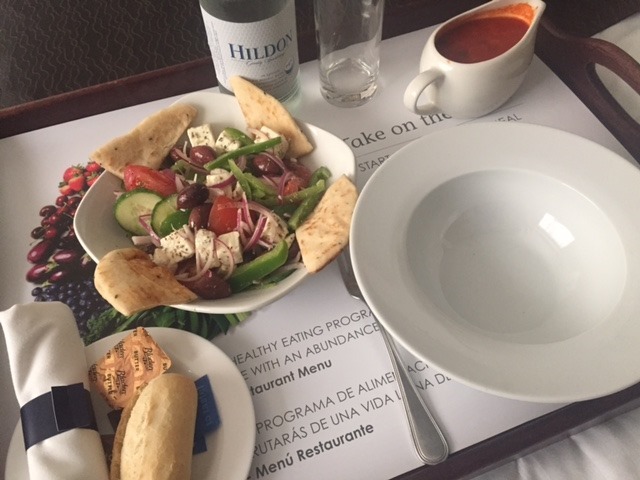 I felt the hunger pangs hit after getting back to my room, so instead of wandering around aimlessly looking for dinner, I decided to go with the room service route. Soup and salad sounded like the perfect way to end the day after a long almost 24 hours of travel. And now let’s hope I make it through the next few days without yawning every few minutes! Happy Monday and thanks for reading!! What kind of flyer are you? Do you like to pass out and not be bothered or do you always find yourself talking to the person next to you? I usually pass out and don’t wake up until touchdown, but for many reasons, this trip turned out differently! I’m a quiet flyer. I read, catch up on movies or have a sleep. If I’m on the aisle seat, I do let my neighbour know to give me a nudge if they need to stretch their legs. Enjoy London. The weather is meant to be lovely this week. The weather was incredible all week long until the day I had to leave. It rained during my car ride to the airport to which I thought, “Aww even London is sad I’m leave!” Haha! Again loved seeing you, P! And just like with old friends, there were no awkward silences and the conversation just kept flowing :)! Hope your Monday is off to a great start..which I am sure it is since it started off with Pret porridge ;)! Thanks, K! It was a great week, and of course, I’m so glad we had a chance to meet! Hope you enjoy the rest of your time in London! I usually try to catch up on reading and writing and sleeping when I fly – 10 hours is a long flight indeed! So cool you got to meet Khushboo! If I manage to stay awake, I prefer to read. But sleep is definitely my #1 choice! And the kind on the plane… you are such a better person than I am. I have no patience! But I do feel bad for any woman who has to fly with kids. That’s not fun! She is awesome! And this whole patience while travelling thing is new to me. I’m trying my best! Wonderful meeting of virtual friends. Glad you’re enjoying your trip. Thanks, Charlotte! it was a lot of fun! awwww i cant wait to meet both of you. i will be chicago last week of July, any chance you will be there???? I sleep a lot when I fly and hardly talk to people. Can’t wait to meet you too, D! It will happen soon…I just know it! Hmmm.. I actually tell myself I’m gonna work on my blog on the plane and then I end up passing out… sometimes I’ll read magazines, I usually don’t like speaking to new people on the plane. 🙂 Have fun!!! The Pret in the UK is so much better! You have to tell me what you think when you try it! And after sleeping, reading is my next favorite thing to do when flying. It sounds like the trip is getting off to a great start, minus the flight discomfort. I love your positive attitude about everything though. I’m really trying to be more positive! Glad it’s coming through! It really is the best part! Ohh man that sounds like a long day of travel! I don’t mind flying too much but long flights can be a little rough. Have fun in London! How fun you got to meet a blogger friend. I really do hope that will happen for us soon! <3 I'm glad you made it safe! I used to travel for my previous job. A LOT. Like, every two weeks and being gone for two weeks. And we went all over the place. While I never got to travel overseas, I did get to see a vast part of Canada including the Yukon Territory! That said, it's made me a bit of a travel snob :-X I've learned to pack light, pack right, and pick the right lines, check-in early, go paperless..all the things! When I do fly international, and it's a late departure, I always make a playlist either on my phone or within the system they have behind the seats and hope I can zonk myself out. If it's a day-time flight, I usually like to take a nap, but sleeping on planes are next to impossible for me. Luckily movies and books can help pass the time! And yes, all this travel has taught me a lot about how to travel and make it “easier” for myself!